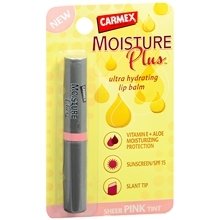 As one of the newest members of the Carmex Blog Squad, I was pleased to receive two of their newest products Carmex Moisture Plus Ultra Hydrating Lip Balm SPF 15 Sheer in both Sheer Pink and Sheer Peach to test and also a set to give away to one lucky AB reader! The best of both worlds are coming together with real moisture meeting light, sheer color. Perfect for any occasion and easy to apply - no mirror required. Children under 6 months of age: ask a doctor before use. I shared this product with my daughter, Robyn because she is my go-to expert on moisturizing lip balms. I tend to simply swipe my lips with my usual lipstick and call it done, so her opinion matters to me in finding a good moisturizing lip balm. She tested it as a stand alone product and I tested it as a moisture boost under said usual lipstick. I really liked the slant tip and the small diameter of the head of the product. It mad it easy to apply and very comfortable. Robyn really liked the taste and tingle of it. I also like the built in sunscreen and the vitamin E that is part of the formulation. I didn't mind the peach color on it's own, but since I usually wear lipstick, I found the tint light enough that it didn't alter my lipstick significantly when I put it over top. The tinted versions of Carmex Moisture Plus Ultra Hydrating Lip Balm SPF 15 Sheer are available exclusively at Walgreens and Walgreens.com for $2.99 each. Do you want your own opportunity to check out these two new products? AB readers here in the US have the opportunity to win both the Sheer Pink and Sheer Peach Lip Balms. This giveaway will run until December 16th at 11:59 PM and is open to US residents only. The winner will be chosen by random.org from all comments and verified before the prize is announced. Winners have 48 hours to accept their prize by responding to the announcement on the blog or by email. Separate comments must be made for each entry to count. Mandatory entry must be completed for subsequent comments to be valid. Tell me which color and what feature of the new Carmex Moisture Plus Lip Balm you think you'd like the most. Disclaimer: I received a complimentary sample of this product for the purposes of completing this review. All opinions are my own.